Vitamin crystals are vitamin C in crystalline powder form, which you can take as dietary supplements if you aren't getting enough vitamin C from foods alone. You can mix this vitamin powder with water and drink it instead of taking vitamin C in pill form. Some people like the taste of liquid vitamin C, have difficulty swallowing tablets, or have heard powdered vitamin C is better absorbed. One perk of crystalline vitamin C is its long shelf life (which is usually about one year). Simply mix it with water when you're ready for your daily dosage. Some people enjoy the taste of flavored liquid vitamin C (vitamin C crystals mixed with water). 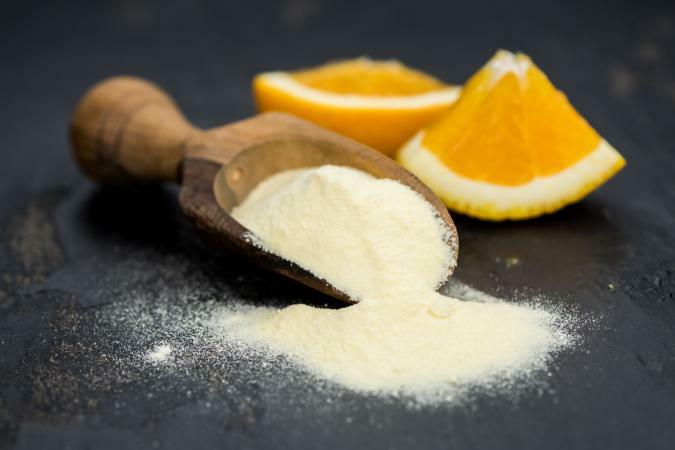 Likewise, you'll likely pay slightly less for vitamin C powder compared with pill forms of vitamin C.
However, you may be surprised to find out consuming vitamin C in powdered form doesn't necessarily offer advantages when it comes to absorption. The Linus Pauling Institute says vitamin C bioavailability (the ability of your body to absorb and use vitamin C) appears to be the same regardless of whether you choose vitamin C tablets, chewables, or vitamin C crystals. While getting vitamin C from supplements is great if you're not getting enough in your diet, including a variety of vitamin C-rich foods in your daily meal plan is best. A 2017 study published in the International Journal for Vitamin and Nutrition Research found vitamin C in foods appears to be much better absorbed than vitamin C from supplements. Likewise, getting vitamin C from fruits and veggies means you're also taking in heart-healthy fiber and other essential nutrients. The University of Maryland Medical Center suggests taking vitamin C supplements (in dosages of 250 to 500 milligrams) two to three times a day, but you should consult with a doctor before taking more than 1,000 milligrams of vitamin C daily from supplements (or if you're planning to give vitamin C to a child). The recommended dietary allowance (RDA) for vitamin C is 90 milligrams for men and 75 milligrams daily for women, so be sure you're getting at least this amount from foods plus supplements to meet your body's nutritional needs. You'll pay about the same (maybe slightly less) for vitamin C powder as you would for vitamin C tablets, but it really depends on the dosage and brand. You might pay $5 or $6 dollars for about 50 servings of vitamin C powder, but costs vary widely. Generally speaking, it's best to pick dietary supplements that are tested by third party companies and meet high quality and purity standards. Examples of third party testers for supplements include USP (U.S. Pharmacopeial Convention), consumerlab.com, and NSF International. Choose brands that manufacture products in facilities that meet cGMP (current good manufacturing practices). This powdered multivitamin supplement contains 1,250 milligrams of vitamin C in each serving as well as a variety of other essential vitamins and minerals. This product is pricy (about $110 for 60 servings), but it is certified by NSF International. Note it also contains herbs, so check with your doctor before taking this supplement. The Bulksupplements brand also manufactures third-party, lab tested vitamin C powder, which received a 5 out of 5 star rating from over 100 Amazon.com customer reviewers. This supplement is also rated as a top vitamin C supplement pick by Reviews.com. One serving (1/2 teaspoon) provides just over 1,800 milligrams of vitamin C, and for $12 you'll receive about 238 servings in each container. PureBulk vitamin C powder is a vitamin C supplement tested by accredited third-party U.S. labs and manufactured in a cGMP-registered facility. You'll be getting 1,000 milligrams of vitamin C in each serving, but the number of servings per bag varies (you'll pay about $6 per bag). You don't have to purchase vitamin C powder to reap the benefits of taking vitamin C supplements. However, if you have trouble swallowing pills or simply like the taste of citrus-flavored vitamin C drinks, consider high quality vitamin C crystal supplements. Avoid taking more than 1,000 milligrams of vitamin C daily from supplements (it's best to get vitamin C from foods if possible) unless you get the okay from your doctor. Check in with your doctor first if you're pregnant or breastfeeding or planning to give vitamin C supplements to a child.